Titanic Belfast is a spectacular and austere six-floor building. The architecture is reminiscent of four ships splitting off from each other. 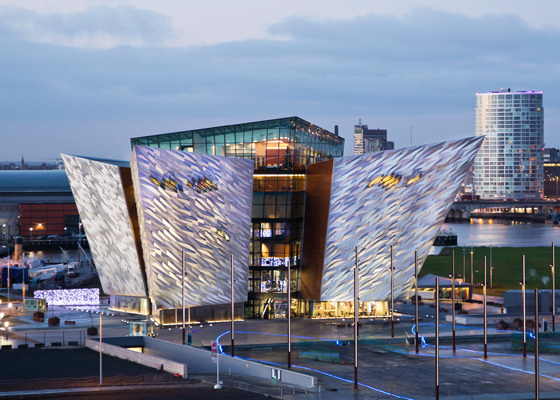 It offers the visitor a trip into Titanic’s history and the city of Belfast where she was built, in fact on the same site where the Museum now stands. With the help of full-scale reconstructions and special effects visitors are able to follow the ship's fate through nine different galleries. The museum cost about EUR 100 million to build. It also houses galleries for temporary exhibitions, a banqueting hall that can accommodate 1,000 guests, business premises, restaurants, cafés, conference facilities and much more. At the time of ordering, the most important requirement made in regard to the air handling unit for Titanic Belfast was that it had to maintain the same air temperature and humidity level all year round. This is because the museum has many old original artifacts from Titanic which it wants to preserve in their original condition, unaffected by the environment in the building. Another requirement was for minimal installation space, while units needed to be energy efficient with a high level of performance. The client chose units from the Flexomix modular range. Some of the units have the EcoCooler integrated condensing unit. The solution has received a lot of praise for its efficiency from operations staff at Titanic Belfast.